Looking back over the last 6 weeks since the Illinois Marathon, my mileage has been very low and I only ran one 13 miler (which, incidentally, left me insanely sore for some reason afterwards). This week, I actually had the opportunity to start adding in some miles. So rather than "tapering" at all for this half, this week ended up being a decent building week. Yesterday I logged an easy 4 miler and it was way hot and my HR was through the roof. Uh oh. I hoped today would be cooler. Sure enough, this morning it was in the upper 50s and just fine. Well, warmer than I like to race in, but fine. I got up at 4:00 am to get ready, but didn't get out the door until just after 6. Big mistake. The traffic leading to the Alliant Center was INSANE and I wasn't able to park until 6:45 (race started at 7:00). I then rushed to check my bag and ran into Donovan and Matt. No time to hit the port-a-potty despite all the hydrating this morning. Yikes. I had decided I would go out at 7:45s and see how everything went. Before I knew it, the gun went off and the huge pack went out in a crowded start. I clicked off the first mile at 7:35ish, same with the second. It felt pretty comfortable, so I decided to go with it. The Madison course isn't easy, and most of the hills are in the middle section, so I enjoyed my flattish start. By mile 5, we had long hills and I knew I just had to hang on. I am bad about losing concentration in the middle miles and I was focusing really well. I took at gel at mile 6.5 because they had signs for Gu and water. Problem - no water! Fortunately the gu never upset my stomach. At mile 10.5ish I saw my friend Jessica and that was a nice boost. I felt really good and started to pick up the pace a little. The problem was that I REALLY had to pee at this point. No good. Finally at mile 12ish, I jumped off into the woods. 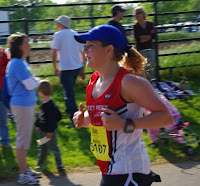 I have never stopped in a race before to pee, but I knew that I was either going to have to slow WAY down or literally pee my pants and that was just not an option. :D So, I lost 30-60 seconds, but I felt SO much better and was able to finish strong. Despite my stop, the last 1.1 pace was at 7:50. There is a really crappy hill right before the turn to the finish, but then a nice little downhill and you can see the finish line. I saw John and the boys yelling and it was really cool. Finished in 1:40:35. According to my Garmin, I was at a 7:36 pace, which made me happy because that was pretty consistent throughout the race. Of course my actual pace was 7:41, but I'll take it. Cool. And even though I was unable to get in a warm-up today, I also broke 45 miles for the week. Back in the saddle. 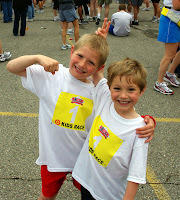 The boys also did the kid race and had a blast. It was really funny. 1:40:35 WITH a pee stop?!?! Nice!